On a dark and stormy night in 1816, Mary Shelley began writing a story that posed profound questions about individual and societal responsibility for other people. To make her point, the young novelist used the scientific advances of her era and the controversy surrounding them as a metaphor for issues of unchecked power and self-serving ambition, and their effect on the human community. Since that time, Frankenstein; or, The Modern Prometheus has become one of the Western world’s most enduring myths. The story provides a framework for discussions of medical advances, which challenge our traditional understanding of what it means to be human. This entry was posted in Exhibits & Events, Uncategorized on February 28, 2018 by Jacqueline Jacobson. It’s always interesting when seemingly unrelated events do in fact have a connection. You’ve probably heard the notion behind the butterfly effect: that the flapping of a butterfly’s wings in Brazil might result in a tornado forming in Texas. Here’s an unexpected connection: the explosion of a volcano in Indonesia in 1815 is believed to have indirectly inspired Mary Shelley to write Frankenstein in Switzerland the following year. The volcano was Tambora. The magnitude of its eruption in April 1815 is thought to be the largest in the last 2000 years. Krakatau (Krakatoa) in 1883 might be better known, and Mt St Helens was more recent and closer to home, but nothing in the historical records beats Tambora for kilograms of stuff extruded. It’s also the unfortunate champ for causing the most fatalities in the local area (more than 71,000, compared to under 37,000 for Krakatau). Mt Tambora had been quiet until 1812, when the locals started observing rumbling and small ash clouds. Its first major eruption occurred on April 5, 1815, followed by a stronger one on April 10. Local inhabitants experienced fire, tsunamis, stones the size of walnuts falling from the sky, daytime darkness with visibility measured in inches, and whirlwinds that uprooted trees and lifted cattle into the air. Ash was also a problem. Nearby homes collapsed under the weight of ash falling from the sky, and ships had to slog through several feet of it floating on the ocean’s surface. In addition, Tambora spewed smaller, lighter particles and sulfur dioxide. These spread around the earth via the stratosphere in quantities massive enough to affect the climate worldwide by blocking a significant amount of incoming solar radiation for several months. 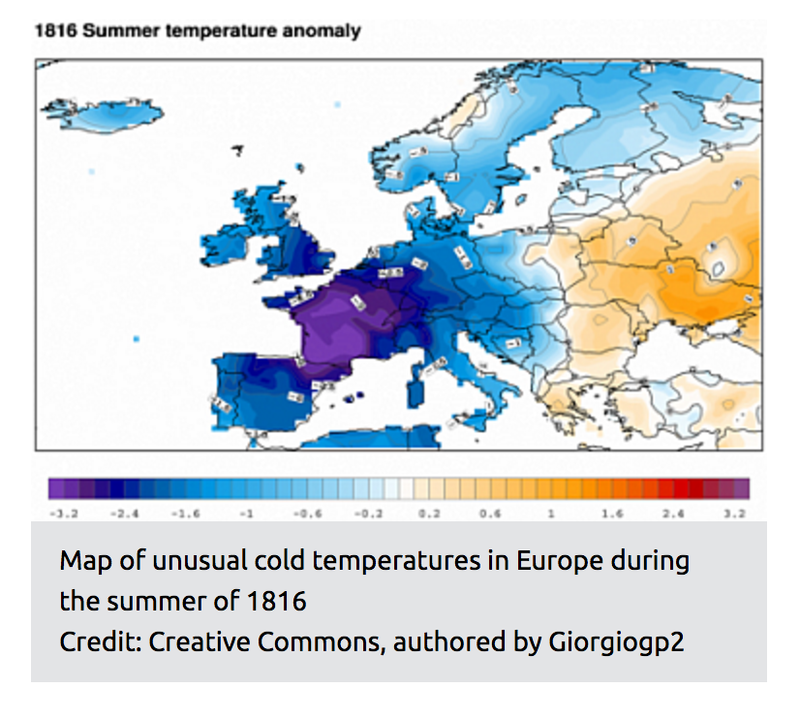 That’s why 1816 came to be known as The Year Without a Summer. Sunlight was blocked; global average temperatures dropped 3 degrees Celsius (about 5.4 degrees Fahrenheit). Under gloomy skies, crops in North America and Europe suffered, farmers were distraught, food prices rose, and famine spread. Among the devastated crops were oats, which were used to feed horses. With this scarcity in “fuel,” transportation costs also rose. Epidemics of typhus spread through the British Isles. Everyone was effected – even creative types. Mary Wollstonecraft Godwin, Percy Shelley, Lord Byron, John Polidori and Claire Clairmont had elected to spend the summer of 1816 at Lake Geneva in Switzerland. Normally the summer there would be pleasant enough, but the incessant chilly, rainy conditions forced Mary and the others to spend much of their time indoors. Eighteen-year-old Mary began writing the manuscript that would become Frankenstein. No surprise that stormy weather prevails throughout much of the story. And while Frankenstein is indeed a story of horror, so too is the volcanic eruption that occurred months earlier and half a world away. The UCR Library provides access to a wide variety of maps, atlases, aerial photos, and geographic data. We hold historical, thematic and road maps, as well as atlases. Our United States Geological Survey (USGS) topographic maps come in various scales for the entire U.S. Geological maps can also be found online through the U.S. Geological Publications Warehouse or the California Geological Survey. Geographical Information Systems (GIS) make maps come to life by storing, analyzing, and relating spatial and geographical information. To support GIS, we provide ArcGIS software on computers in the Orbach Science Library Map Room and Learning Commons computers, as well as Learning Commons computers in Rivera Library. We can help you identify, obtain, and organize data sets for your research – email us at dataconsult-lib@ucr.edu. This entry was posted in Uncategorized and tagged frankenstein, Guest_Post, mary shelley on May 26, 2017 by Jacqueline Jacobson. 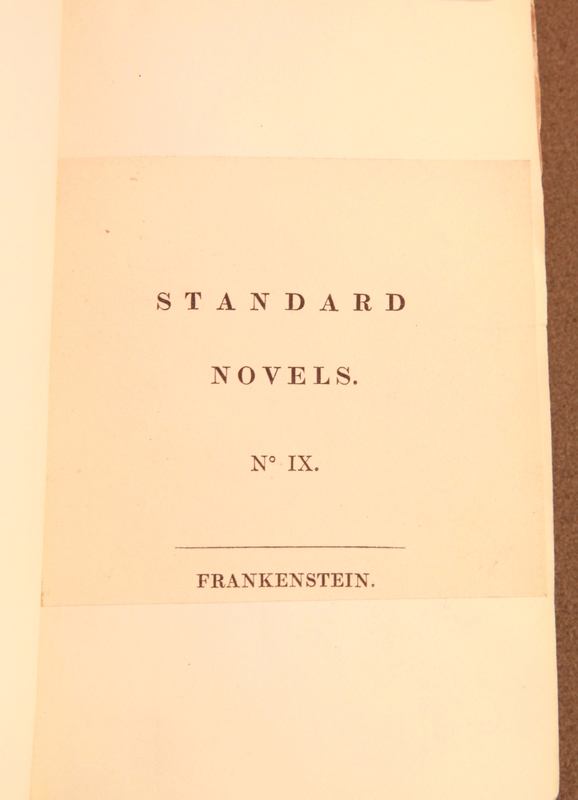 So, what are the “standard novels” referenced by the cut-and-pasted title page of the Eaton’s 1831 Frankenstein? In 1829, publishers Henry Colburn and Richard Bentley joined forces with a simple business plan: they acquired copyrights to popular three-volume novels, and then republished them in inexpensive, one-volume formats. According to Victorian Fiction: An Exhibition of Original Editions, this “Standard Novels” series, which began releasing volumes in 1831, “expanded the market of fiction” to include people who could not previously afford such books. In some cases, Colburn and Bentley also asked for authorial revisions, or new material, so that they could claim to have the “most authoritative” versions of the texts at the time. 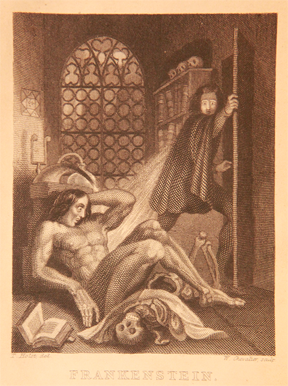 Plus, to make these popular novels even more exciting, each of the volumes featured an engraved frontispiece, giving us the following iconic image of Victor Frankenstein running from his Creature. Besides Mary Shelley’s Frankenstein, which was volume 9 in the series (along with the first part of Friedrich Schiller’s The Ghost Seer.) Other volumes of note include number 6, James Fenimore Cooper’s The Last of the Mohicans, and five reprints of Jane Austen novels. Although Colburn and Bentley’s partnership only lasted for three years, they published the first 19 volumes of the series together, and even after Colburn left the partnership, Bentley went on to publish 107 additional volumes, for a grand total of 126 volumes between 1831 and 1855. For the curious, a list of titles is here. “Richard Bentley” in British Literary Publishing Houses, 1820-1880. Eds. Patricia J. Anderson and Jonathan Rose. Vol. 106 in the Dictionary of Literary Biography (Detroit: Gale Research Inc., 1991). Pages 39-52. “Bentley’s Standard Novels” in Victorian Fiction: An Exhibition of Original Editions at 7 Albermarle Street, London, January to February 1947. Arranged by John Carter and Michael Sadleir. Published for the National Book League (Cambridge: Cambridge University Press, 1947). Page 11. 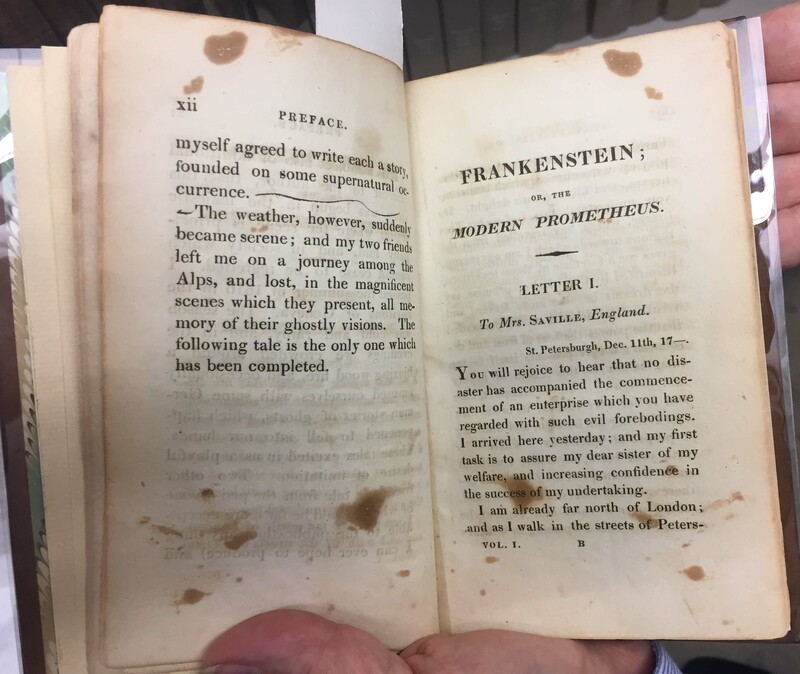 This entry was posted in Editions, Uncategorized and tagged 1831 frankenstein, british publishing houses, colburn and bentley, editions of frankenstein, frankenstein, frankenstein publication, mary shelley, publication history on April 27, 2017 by Jacqueline Jacobson. 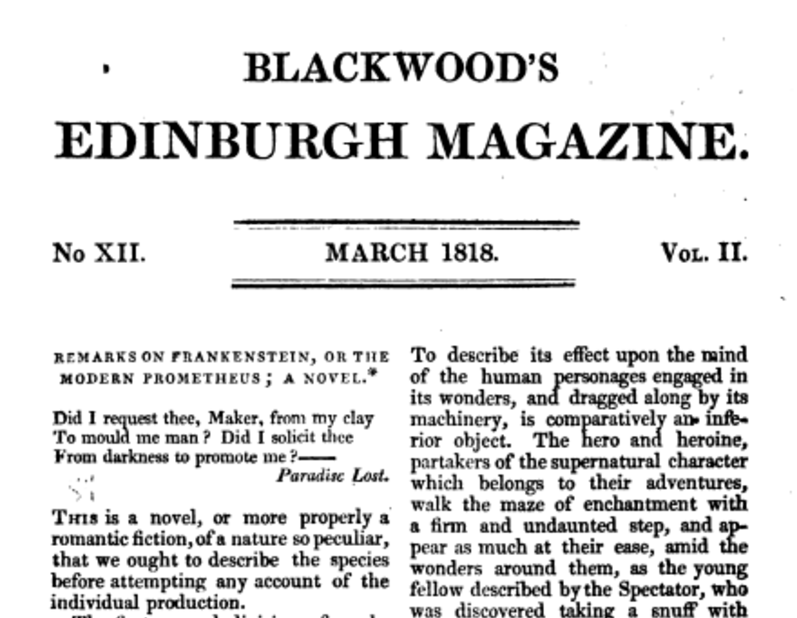 One of the earliest reviews of Frankenstein was written by Sir Walter Scott for Blackwood’s Edinburgh Magazine in 1818. Overall, Scott wrote that the “author’s original genius” impressed him (p. 613). However, he was unsure how to describe the “peculiar” genre, or, as he called it, “species” of the novel. Now in the public domain, the complete issue of Blackwood’s that contains the first review of Frankenstein is available digitally via HathiTrust.org. The University of California, Riverside Library also holds a copy of this volume, available here. Scott, Walter. “Remarks on Frankenstein, or, the Modern Prometheus; a novel” in Blackwood’s Edinburgh Magazine, no. XII, vol. ii (March 1818). pp. 613-620. Original from the University of California Library, and available digitally via HathiTrust.org. “Science Fiction” definition A1 in The Oxford English Dictionary Online. From the Oxford English Dictionary 3rd edition, March 2014. Web. 13 April 2017. This entry was posted in Uncategorized and tagged 1818, blackwood's edinburgh magazine, contemporary review, frankenstein, mary shelley, review, science fiction, walter scott on April 14, 2017 by Miranda Butler. This entry was posted in Uncategorized on November 22, 2016 by frankenblog.